TCCX series is a range of lenses designed for flat surface measurement and defect inspections that offers the same magnifications and working distance of TCLWD series while adding integrated coaxial light.Such lighting configuration is required to homogeneously illuminate uneven surfaces and detecting small surface defects such as scratches or grooves, finding application in many industries: from electronic and semiconductor to glass and mechanics. 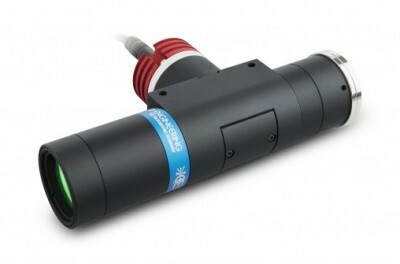 All these lenses operate at a working distance of 135 mm while their large numerical aperture enables the superior resolution needed for small pixel cameras, matching and even exceeding the industrial requirements of on- and off-line applications.The built-in LED source, equipped with advanced electronics, provides excellent illumination stability and homogeneity, key factors for the reliability of any machine vision system. The unique optical design minimizes the back-reflection issues of conventional coaxial illumination systems: this makes TCCX the perfect choice especially when highly reflective flat surfaces (approx. > 30% reflectance) are involved.Application examples include recognition of silicon wafers pattern and inspection of LCD displays, polished metal surfaces, plastic and glass panels, and many other. For small pixel size camera resolution. Tailored for electronic components inspection. Ideal for high-end applications in semiconductor industry. Robust and precise tuning of the camera phase.